Big Loon is waiting off shore. A clock is set to stop when Big Loon brakes through the ice. When will that be? Will you be the lucky person to Win ? When the Big Loon starts swimming, the official clock will stop, marking the day & time of Ice Off. Each guess costs only $3.00 or 4 guesses for $10.00. Win 50% of the earnings goes to the winner. 50% goes to SLA Eurasian Water Milfoil control effort. Or: on Squashlakeassociation.com press the PayPal donate button to pay with your credit card. Write your guesses in the memo section. Entries & payments will be accepted Feb. through midnight April 1, 2017 or ice off, whichever comes first! Rules: If two or more people guess the same winning time the 50% of the pot winnings will be split between them. In the event that any unforeseen occurrence makes it impossible to determine the exact time of ice off, the winner will be determined by drawing, lottery fashion from the guesses within the day of ice off. All decisions of the Ice-Off committee are final. Will you WIN the Annual Squash Lake Ice-Off contest?! Spring is coming but how soon? When will the ice go off Squash Lake? Guess when Big Loon will be swimming? Big Loon’s clock will stop when the ice is thin enough for him to break through and swim. You could be the winner of this 50/50 contest! Click on “ice-off-ticket-and-rules-for-entry” for the Ice Off Contest Entry form and contest rules. Coy the form, fill it out and mail it with your check to SLA, PB Box 511, Rhinelander, WI 54501. On the Welcome page of the Squash Lake Association website, look for and click on the “Donate” button. Enter the dollar amount. Then in the message box type your guesses. Last pay with your credit card or PayPal account. Go to The Town Pump and pick up an Ice-Off entry form. Just fill in the form and put the form and your money in the Ice Out Jug. Click here to see what your friends and neighbors have guessed. Squash Lake’s portion of the money collected will go for Eurasian Water Milfoil Control. The Board Meeting scheduled for November 19 has been cancelled. Enter your best guess to win the Annual Squash Lake Ice-Out Contest! Spring is coming but how soon? Guess when Squash Lake will be ice-free and you could win the Ice-Out Contest. Guess when Loonie will be swimming! 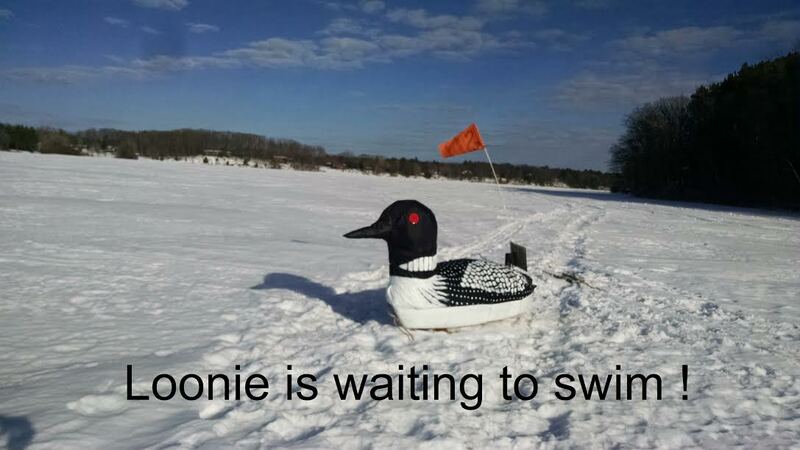 Loonie’s clock will stop when the ice is thin enough for him to break through and swim. You could be the winner of this 50/50 contest! $3 per guess or 4 guesses for $10. Click ICE OFF TICKET AND RULES FOR ENTRY for the Ice Out Contest Entry form and contest rules, copy and mail with your check to SLA, PO Box 511, Rhinelander, WI 54501. Click ICE OFF TICKET AND RULES FOR ENTRY for the Ice out Contest Entry form and contest rules, fill in your ice-out guesses on the form and email the form to SquashLk.Board@gmail.com. Then look for the “Donate” button located on the Welcome page of the Squash Lake Association website for convenient pay with your credit card or Paypal account. Forms can also be turned in at 3 local business: The Town Pump, The Fireside & The Woodpecker. Just fill in the entry forms and put the form and money in the Ice Out Jug. Feeding deer in Oneida County will be limited due to the discovery of chronic wasting disease late last year. That deer was discovered on a game farm near Three Lakes in Oneida County in December. As a result, a ban on baiting or feeding will go into effect on Monday for not only Oneida, but also Vilas and Forest Counties. State law requires that the DNR enact a ban on feeding and baiting of deer in counties or portions of counties within a 10-mile radius of the infected deer’s location. Both Forest and Vilas Counties fell within that distance. Once the ban goes into effect, it will bring the overall total to 41 counties statewide. The DNR says Individuals may still feed birds and small mammals, provided the feeding devices are within 50 yards of a human dwelling and at a sufficient height or design to prevent access by deer. The Squash Lake Association was awarded the Healthy Lakes Initiative grant by the Wisconsin DNR, effective April 15, 2015. The two-year grant is new for the DNR, and it is intended to provide financial assistance to lake property owners for improving lake habitat through small and medium-sized projects. These projects include water diversion and infiltration techniques to reduce runoff into lakes, rain gardens, native plantings, and fish sticks as best practices covered by the grant. The grant will pay for 75% of the cost up to a maximum reimbursement of $1000 for each project. Multiple projects per land owner are acceptable. Applications must have: included descriptions of the individual projects, been “shovel-ready”, and included pledges from property owners promising to complete the project. Though the pledge is non-binding. The Squash Lake Association submitted four best practices projects for grant consideration in its application. All four were funded. Squash Lake was only one of eleven (11) organizations statewide to receive the grant from the Wisconsin DNR in 2015. It is the only organization in Oneida County and the Northwoods Region to be awarded funding. The remaining ten (10) recipients include: 3 in Polk County and 2 in Washburn County in NW Wisconsin, and 1 recipient in each of Adams, Dodge, Green Lake, Shawano, and Waukesha Counties. Should property owners on Squash Lake wish to learn more about the Healthy Lakes Initiative, please contact Dan Butkus, SLA President, at dan.butkus@yahoo.com. If more property owners become interested, the association will look at reapplying for this grant in the 2017/2018 cycle. It may also be possible to cover one more project on our lake under the 2015/2016 grant, but this is not guaranteed, and would be pending the DNR’s approval to amend the grant. The Squash Lake Management Plan, the roadmap for the preserving and enhancing Squash Lake for future generations, is now complete and available. Look for details under “Lake Plan” at the top of this page. The finished plan will be introduced at the SLA annual meeting June 26, by our lake management plan consultant, Onterra’s Brenton Butterfield. He will explain the plan and take questions from residents attending the meeting. Attendance is vital at the annual meeting. Not only will residents learn how the plan affects the future of Squash Lake, but the time spent by SLA members participating in the meeting count toward volunteer hours that offset out-of-pocket money required to pay for the state grant.